For our sawmilling readers this week we’ve included a video clip posted shortly after the opening of Red Stag Timber’s new NZ$100 million mill upgrade last year. A camera’s been very carefully (no room here for mis-calculation) mounted on the front end of a log. It shows it being put though the new log line. Very clever and you’ll see that the positioning was spot on. With lumber shortages in the US projected over the next couple of years, it’s expected that sawmillers from this part of the world will also continue to ramp up their lumber production and exports into the US. A recent report out shows that competition in the US market for lumber exporters is likely to come from European sawmills. 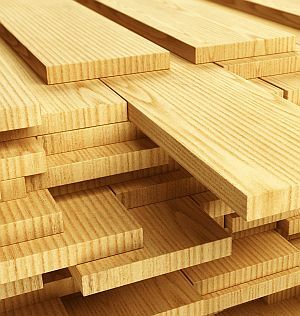 The first two months of this year have already shown that European lumber imports have grown by 125%. Last week, the AI Forum released a major study, Artificial Intelligence: Shaping a Future New Zealand. It looks at the potential for AI in New Zealand. We’ve included a link to the report in the story below. Findings point to AI potentially increasing New Zealand’s GDP by up to $54b by 2035. The reasoning is that AI and automation are expected to free people up to focus on more complex, higher value tasks in their jobs. It may also help address potential labour shortages and the demographic challenge of an ageing workforce. That’s where it is showing real promise for our own industry, in wood processing and manufacturing. You might think that this isn’t going to impact on us or it’s still a few years away yet. Think again. Speaking in Sydney just a couple of weeks ago (see story in this week’s issue), Visy’s Anthony Pratt said that the company has recently established a technology and digital hub in Singapore. Its brief - to incorporate IT, AI and robotics into every aspect of its global packaging, paper-making and recycling businesses. Pratt said that the level of automation provided by robots make labour costs irrelevant. It’s already helping the Australian manufacturing industry compete against organisations overseas. The opportunities in local wood manufacturing operations will be covered in more details at this year’s WoodTECH 2018 series being planned for local wood manufacturing companies in September. Also, from Australia, aside from a generous Budget announced during the week including AU$20 million that has been earmarked to develop a National Forest Industries Plan, the NSW Government announced this week a AU$45 million “intervention package” to protect the local koala population. It involves, amongst other things, setting aside 25,000 ha of state forests. Industry groups representing NSW’s timber and forest products industries came out and slammed the announcement. Real concerns are being expressed about the lack of industry consultation, the impact that the decision is going to have on future wood supplies from the region and the lack of evidence pointing to benefits to the koala population from setting aside another 25,000 ha of native forest. Finally, for those looking to attend the upcoming Woodflow 2018 series in mid to late June, today is the last day to access discounted registrations. They’re now rolling in. If interested in learning more on new innovations around log measurement, log tracking, new wood transport technologies and tools for managing wood flows and planning, you should ensure you’re there for this two-yearly tech update. For your information we’ve profiled some of the international presenters and exhibitors (outside of Australia or New Zealand) who’ll be involved in a story below. Details can be found on the event website, www.woodflow.events. Enjoy this week’s read. Oceanwood has entered into a sale and purchase agreement to buy the entire issued share capital of Norske Skog AS (Norske Skog). Following a four-month competitive auction process, in which more than 100 prospective bidders were approached, Oceanwood emerged as the winning bidder. The acquisition is subject to Oceanwood obtaining the relevant antitrust and other regulatory approvals in the countries concerned, including Australia and New Zealand, which is currently anticipated to take between four and six months to obtain. Sven Ombudstvedt, the chairman of the board of Norske Skog AS, says: “This is one of the most important milestones for the Norske Skog Group in recent years. It concludes almost two years of relentless efforts and engagement to address the Norske Skog Group’s excessively levered capital structure.. The board of Norske Skogindustrier ASA had filed for bankruptcy in December 2017. Lars P. S. Sperre, the President and CEO of Norske Skog says: With Oceanwood as a financially strong new owner, the Norske Skog Group and our employees now have a unique opportunity to further develop a sustainable business platform capable of strengthening our core business and investing in promising new growth projects. Norske Skog is a leading producer of publication paper with strong market positions in Europe, where it occupies a top-tier publication paper position, and Australasia, where Norske Skog is a leading producer of publication paper in a concentrated market. Norske Skog operates a total of seven profitable paper mills with total paper production capacity of 2.7 million tons, comprising 1.8 million tons of newsprint and 0.9 million tons of magazine paper (supercalandered and coated mechanical). Oceanwood is an independent investment management firm founded in 2006. Located in London and Malta, the firm manages over US$2 billion of capital, primarily for public pension plans and other institutional investors. For more information on the announcement click here. The Australian Forest Products Association (AFPA) welcomes the AU$20 million funding commitment earmarked in this week’s Federal Budget to underpin the initial implementation of a National Forest Industries Plan, Chief Executive Officer of AFPA, Mr. Ross Hampton said. “Later this year the Federal Government has said it will deliver a new national blueprint for Australia’s forest industries, something well overdue, given the last major plans were in 1997 and 1992. The funding package committed to this week primes the pump to underpin the implementation of a solid National Forest Industries Plan,” Mr. Hampton said. -	determine opportunities and gaps in key regional forestry hubs. “Earlier this year, AFPA released a document Towards a National Forest Industries Plan: Key Industry Asks which outlined the significant needs that forest industries require to remain a strong part of Australia’s economic and social future,” Mr. Hampton said. “This week’s Federal Budget made a great start to what Australia’s forest industries will require as part of the new National Forest Industries Plan. AFPA and industry will continue to work with the Federal Government to ensure the elements needed to turbocharge local timber products manufacturing in this country are delivered. The worlds most advanced sawmill and the first ‘super-mill’ in the Southern Hemisphere, Red Stag Timber, was opened in Rotorua on 23 March last year. A new sawmilling line and upgrade programme, valued in excess of NZ$100 million was celebrated. I’m not sure if you’ve seen this yet. This video of a log going through the new log line at Red Stag was posted shortly after the opening. Enjoy. A AU$45 million intervention package to protect the threatened koala population has been announced by the New South Wales Government. Thousands of hectares of land will be set aside for koalas, which have fallen in population by about 26 per cent over the past two decades in NSW. 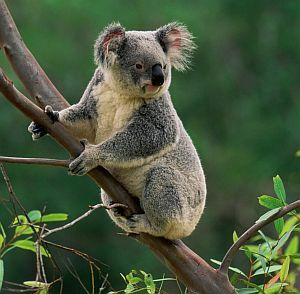 Almost 25,000 hectares of state forest in the mid-north coast will become a koala habitat. More than 20,000 hectares of state forest on the Central Coast, Southern Highlands, North Coast, Hawkesbury and Hunter with koala habitat will be used as new koala reserves. Over 4,000 hectares of native forest on the Mid North Coast will also be transferred to the National Parks Estate. About AU$20 million from the NSW Environmental Trust will be used to purchase land with prime koala habitat that can be permanently reserved as national parks. The actions to conserve koalas were informed by a 2016 review of the state's decline of koala populations, led by the state's chief scientist Professor Mary O'Kane. The strategies plan to be implemented and monitored over three years and reviewed in 2021 reports “> ABC. Industry groups representing NSW’s timber and forest products industries have slammed the NSW Government’s announcement to lock up more State Forest, with no evidence that it will lead to better conservation outcomes for koalas and without consulting with industry. Timber NSW and the Australian Forest Products Association (AFPA) said that while Australia’s forest industries are committed to koala conservation, we need evidence-based decisions that recognise the vital role that our production forests play in the sustainable management of our forests, including the forest industries’ considerable investment in conservation, bushfire mitigation and recreational amenities. Timber NSW and AFPA are also demanding answers on how today’s announcement will impact on future wood supply for the industry, and what the Premier means when she says that the 24,538 hectares are just a starting point. Timber NSW General Manager, Ms Maree McCaskill, said today’s announcement undermined the work of the NSW Forest Industries Taskforce and the NSW Forestry Industry Roadmap, which promised a more consultative, evidence-based approach to forest policy. The Taskforce has not been convened for almost 6 months (the last meeting was on 24 November 2017). “With 90 per cent of NSW’s forests in National Parks and Reserves (80 per cent, or almost 6 million hectares) or in State Forest Reserves and protected areas (10 per cent, or about 1 million hectares), and just 1-3% per cent selectively harvested each year and then regenerated as required by law, we should be demanding to know why our extensive reserves system is failing,” Ms McCaskill said. “The NSW Government continues to ignore the single biggest message from industry that we cannot sustain any further reduction in production forest. Above all else we need resource security and policy stability to drive the investment decisions that will allow our industry to innovate and grow,” Ms McCaskill concluded. Alexander Mastrovito, Head of Sustainable Transport Solutions, Scania - Asia & Oceania, Hong Kong. Alexander is the project leader for Scania’s autonomous vehicle development in Singapore and the head of sustainable transport solutions for Scania in Asia and Oceania. He’s responsible for promoting and implementing future solutions; electric and alternatively fueled vehicles, connected transports and self-driving trucks and buses. He heads up Scania’s regional work in Asia paving the way for electromobility, autonomous vehicles, ITS and mobility as a service. Prior to joining Scania Alexander was based in Beijing spending 11 years in the Greater China region working in the automotive industry. Max Blatt, Head of Business Development, LOTS Group, Sweden. As Head of Business Development for LOTS Group, a Scania company, Max has had 17 years’ experience in managing the implementation of strategic and operational improvement initiatives within forest products and other heavy manufacturing sectors across North America, Europe and Asia. A former Director at Pöyry Management Consulting and Head of Western Operations for Perforex, Max has worked with over 100 companies in 25 different countries. Vallo Visnapuu, Chief Executive Officer, Timbeter, Estonia. Vallo Visnapuu has been working within the timber industry for 16 years. In 1999 he started up a sawmill as a co-owner before becoming involved in setting up a birch veneer mill between 2001-2005. Five years ago, he co-founded Timbeter, a startup company based in Estonia aimed at assisting log tuck and transport companies to measure log volumes using smart devices such as mobile phones. 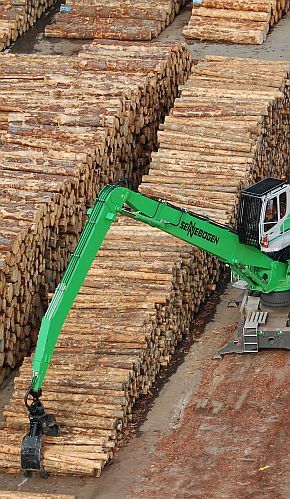 The Estonian State Forest Management Centre truck drivers now use Timbeter as a measurement tool and the system is being applied by a number of forestry companies. John Trus has worked at Remsoft Inc., a well-known company in this region that provides software solutions that leverages data analytics to offer precise operational plans, schedules and long-term strategies that help businesses improve their performance and productivity. For the past seven years with Remsoft, John has worked with forestry and asset management clients in more than a dozen countries across six continents. John brings 25 years of experience in supply chain, optimisation, and process improvement solutions with global software companies. In addition to presenting at the conference, Remsoft wqill be running a short workshop in both Rotorua and Melbourne which is open to all conference delegates before each conference. Details can be found on the event website. Doug Folkins is a registered professional forester in British Columbia, Canada, with over 24 years of experience in the forest industry. Doug spent the first 11 years of his career working as a forestry manager on Vancouver Island working for two of BC’s largest forest tenure holders. Since 2005, Doug has been working at JRP Solutions and using his professional experience to bring software solutions to forest management organizations across North America. Douug will be detailing ForestOPS, a management and operational tool for harvest scheduling, log transportation, wood flows and mill inventory. In addition to two days of presentations on new technology and operating practices, two free workshops on transport planning, a series of exhibitions from leading tech providers will be set up. Included among the many exhibitors is WoodTECH, a Chilean company that has supplied the region's first 3D laser scanner for measuring wood loads to a forestry company in Tasmania. Full details of the WoodFlow 2018 series can be found on the event website, www.woodflow.events. The conference programme, including two workshops around transport planning the day before each conference, run in Melbourne, Australia on 20-21 June then again in Rotorua, New Zealand on 26-27 June. Note: Discounted early-bird registrations to attend the conference FINISH TODAY, Friday 11 May. If registering you or some of your team, best get onto it today. In New Zealand, the Ministry for Primary Industries (MPI) has established three new business units — Biosecurity New Zealand, Fisheries New Zealand and New Zealand Food Safety — with a Forestry business unit launching today, on 11 May. These units will provide increased focus on some of MPI's core responsibilities and align structure to ministerial portfolios. Martyn Dunne, director-general of MPI, said, "The business units are intended to lift the visibility of the valuable work we do in biosecurity, fisheries, forestry and food safety and increase transparency for our stakeholders and the public. "Our new structure will enable us to deliver on MPI's ambitious agenda for the primary sector and New Zealand. Remaining one ministry allows us to continue strengthening the capabilities and expertise we have built since our formation." The ‘Augmented Intelligence’ team, comprising entrepreneurs and health clinicians from Canberra and Brisbane, has developed a smart steering wheel concept to curb truck driver fatigue. According to an Australian Broadcasting Corporation (ABC) report, this smart steering wheel concept features embedded ECG monitors that are visually communicated to drivers through a GPS device, suggesting rest stops in real-time based on heart rate readings. Andrew Hammond of the ‘Augmented Intelligence’ team told the ABC that the smart steering wheel will prevent drivers from “pushing through unnecessarily, or they can stop earlier if there are better facilities available”. "There is clinical research and papers available that show high speed heart rate is a predictor of fatigue," said Hammond – adding that the steering wheel would also signal other health risks including early onset of heart disease, stroke and diabetes risk. The team, which said the technology would cost AU$100 per truck a month for an unlimited number of drivers, won AU$6,000 in cash from the Australian Trucking Association (ATA) and Teletrac Navman at the recent FatigueHACK event. They also reportedly won coaching from the Canberra Innovation Network to progress the idea. "It is quite exciting," said Hammond. "We want to actually have an impact on the world and now we have the platform and a bit of funding to make it happen." 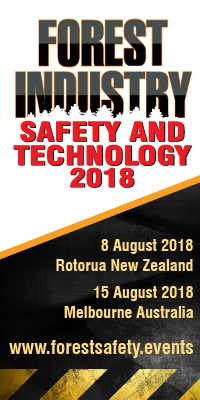 As part of the upcoming WoodFlow 2018 series running in both New Zealand and Australia later in June, a raft of tools developed to improve harvesting and haulage safety and productivity through fatigue management based on recent work with forestry and contracting companies in South Australia will be presented. Transport and driver safety technologies as applied to those companies involved in log transport will also be outlined by leading trucking companies and associations. Full details on the programmes for both Rotorua and Melbourne can be found on the event website, www.woodflow.events. The BC Saw Filers Association drew an impressive crowd in Kamloops, B.C., April 26-28 for what is being called the largest convention of its kind in North America. It’s an encouraging sign for the filers (saw doctors) who gathered to discuss not only the latest technology for their trade, but the need to attract new talent. For the first time the convention trade show ran two full days, giving 30 vendors filling 60 booths needed time to show off their latest offerings for the filing room. For a review by Wood Business of some of the key technologies being showcased, click here. An innovative partnership has been announced between Australian genetics technology firm Gondwana Genomics and timberland investment manager New Forests, seeking to deploy genetic technology to boost productivity in tropical eucalyptus plantations. Following successful demonstrations, the two companies are collaborating on the world’s first large-scale investment in tropical eucalyptus Marker Assisted Selection (MAS), aiming to deliver significant gains in tree plantation productivity and resilience at two New Forests’ investments in Southeast Asia. New Forests is an Australia-headquartered investment manager responsible for more than AUD 4.5 billion in assets under management across 915,000 hectares of forests and land in Australia, New Zealand, Southeast Asia, and the United States. New Forests’ Singapore office manages the company’s tropical forestry investments and operations in Southeast Asia. 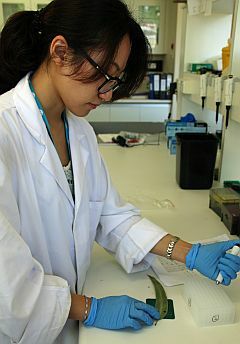 Gondwana Genomics is a privately held Australian company using pioneering genetic methods to make next generation tree breeding tools commercially available. The company holds an exclusive license to its MAS technology, which uses targeted DNA sequencing to identify specific genetic traits, such as disease resistance, strength, density, higher pulp yield, and faster growth. The joint initiative will deploy MAS technology at two of New Forests’ investments from its Tropical Asia Forest Fund. Acacia Forest Industries of Sabah, Malaysia and Mekong Timber Plantations of central Laos will work together with Gondwana Genomics to execute a multi-year program of MAS tree breeding. The program targets improvements in growth, yield, and wood fibre characteristics while also seeking to enhance resilience to pests and disease. The collaboration aims to bring forward targeted growth improvements, resulting in faster growing plantations that achieve higher levels of performance in as little as three to five years, as compared to original targets of five to eight years. MAS technology is also known as smart breeding as it enables tree breeders to select for desirable traits and accurately predict the performance of a tree using a DNA test. This MAS approach does not require genetic modification but rather uses genetic sequencing to more accurately and rapidly identify traits in a structured breeding program. MAS technology enables highly targeted cross-breeding, with further tests able to determine whether offspring are inheriting the right genes from each parent, thereby speeding up the development of the next generation of elite trees. In commercial application, this can result in rapidly improving plantation quality to meet market and operational demands. It’s a hot, windy February day - perfect conditions for fire. Twenty-seven scientists and several million dollars of specialised equipment are gathered in a paddock of harvested wheat stubble near Darfield, Canterbury, New Zealand. As Jason Forthofer from the US Forest Service’s Missoula Fire Sciences Lab counts down to ignition, the researchers are all hoping the burn will bring the same thing: data. They will use this data to help unlock the mysteries of fire behaviour and produce better models for fighting wildfires. This is the first phase of a four-year burning programme that will test a new theory on fire spread. It’s a collaboration between Scion’s Rural Fire Research Team, the University of Canterbury, Missoula Fire Sciences Lab and San Jose State University’s Fire Weather Research Laboratory. The new theory was developed in the US Forest Service lab in Missoula, Montana, but this is the first time it’s been tested in the field. 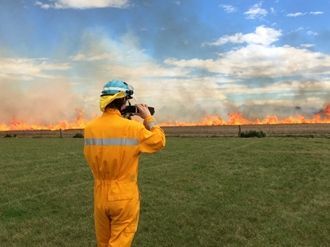 As the stubble fire is ignited and sweeps across the paddock, the researchers are pleased to see the flames move past their sensors as planned. Most of the equipment has been designed and built by the people looking on. The Scion team has organised the field research and has their own sensors laid out in the paddock and weather towers reaching up to record atmospheric details. From a cherry picker just north of the paddock, University of Canterbury Geography researcher Marwan Katurji is looking after three infrared cameras, which are measuring the surface temperatures before, during and after the burn. A fixed-wing and quadcopter drones capture images that measure how fast the fire is moving. A couple of hundred meters away, researchers from San Jose State University are sitting in the shade of a van, monitoring the Doppler LIDAR machine they have brought all the way from California. LIDAR stands for Light Detection and Ranging. It’s like a radar that uses reflected light instead of sound waves. The LIDAR data will show the air movement above and around the fire. Photo: A member of the Scion fire research team observes fire spread during one of the stubble experimental fires. Last week, the AI Forum (that’s Artificial Intelligence – not Artificial Insemination) released a major study about the potential for AI in New Zealand. For those interested, it is available free on the AI Forum website: Artificial Intelligence: Shaping a Future New Zealand. The report is the culmination of nearly a year’s work with research partners IDC and Sapere, examining the local and international AI landscapes and investigating potential impacts on New Zealand’s economy and society. The report identifies key opportunities which New Zealand can invest in now to actively shape our collective future. At a glance, the report shows that New Zealand has a young and growing AI ecosystem, however major AI investment by other countries around the world raises challenges for New Zealand to keep up with global AI advancement. The report finds that AI has the potential to increase New Zealand GDP by up to NZ$54b by 2035, as AI and automation frees people up to focus on more complex, higher value tasks in their jobs. It may also help address potential labour shortages and the demographic challenge of an ageing workforce. The report also explores the challenges that AI presents for our society; for jobs, the law and new ethical considerations. There are long term implications for core legal principles like legal responsibility, agency and causation. AI raises many new ethical concerns relating to bias, fairness, transparency and accountability. This detailed report is an excellent piece of work that is already increasing the national discussion about AI and initial policy discussion. An additional launch event happened this week in Auckland and is planned next week in Christchurch. Packaging giant Visy sees a future where its boxes have the intelligence to be self-monitoring, according to the company’s executive chairman and billionaire boss, Anthony Pratt. Speaking at the AWS Summit in Sydney, Visy’s chief told the audience the organisation is “not far away” from seeing packaging that can monitor its contents in the consumer’s home, automatically trigger a reorder, or provide proof of origin for supply chain integrity. “So that a mother who needs infant formula for her baby knows exactly what she is getting, when it is ordered and that it’s not an inferior copy. Or with new advances in digital printing, the box may have personalised printing so when you open the box, it may say, ‘happy birthday Anthony' when you open the lid,” he said. Visy recently established a technology and digital hub in Singapore with a brief to incorporate IT, AI and robotics into every aspect of its packaging, paper-making and recycling businesses globally, said Pratt. 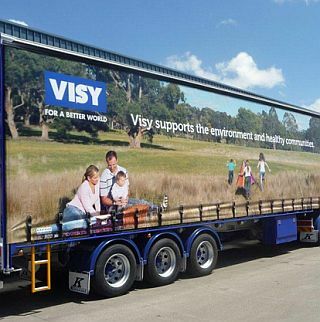 Understandably, Visy and Amazon Web Services have a close business relationship. Last year, Visy went into the public cloud, moving most of its workloads to AWS. Around 100 applications, including its core SAP system, went across to the platform. Pratt said that its SAP platform is running 10 times faster in the cloud, tech costs have dropped by 30 per cent, and outages have been eliminated. Visy works with Amazon to shorten supply chains to reduce the cost of shipping goods from the tech giant’s warehouses to the end customer. 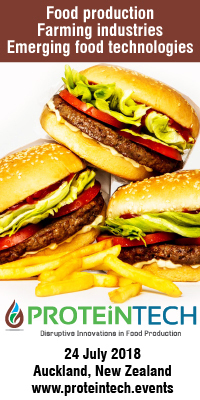 Pratt Industries in the United States has already created custom-made boxes for Amazon in America that, for example, keep fresh food cooler, he said. "We are now trailing additional services, including machine learning, to help with our sales and OHS data. Energy is a huge cost for us and the alliance with AWS is enabling us to trial artificial intelligence to bring down our energy usage," he said. Pratt claimed the level of automation provided by robots make labour costs irrelevant and are helping the Australian manufacturing industry compete against organisations overseas. "The level of automation in robotics now involved in the best box factories is as sophisticated as the world's most modern manufacturing facilities," he said. The forestry industry says Whanganui District Council is trying to double-dip with its proposed forestry rate. It’s an issue being discussed in other regions in New Zealand as well. The targeted rate would more than double forestry's contribution to roading and is one of three key proposals in council's draft 10-year-plan. The council estimates the impact of harvesting on roading will cost NZ$225,000 per year over the next six years but it currently only collects NZ$90,000 from forestry properties. Under the proposed targeted rate, forestry properties would pay two and a half times more what they currently pay for roading to make up the balance. Currently forestry pays an average NZ$4 per hectare in roading rates while the average for other farming land uses is NZ$15 per hectare owing to the relative lower value of forestry land. Arbor Management's Peter Martin, a forest owner himself, told Tuesday's long-term plan submission hearings the proposed rate was "selective and unfair". He said no one lived on forestry properties but general rates were still charged on them. "As forestry owners we are paying rates for elevators, museums, libraries, roundabouts, Virginia Lake and so it goes on." Instead the general rate paid on forestry properties should be transferred to the roading contribution, Martin said. "That would only be fair. More >>. The streak of record-high U.S. lumber prices caused offshore softwood lumber exports to the U.S. to expand rapidly in 2017 versus 2016 reports Russ Taylor, Managing Director of FEA Holdings – Canada Inc. The same trend is expected in 2018. In 2005, the U.S. imported a record volume of non-Canadian lumber — over 6.9 million m3. Following that, they plummeted, declining more than tenfold by 2012 before beginning a slow and steady rise through to 2016 (during which year they reached 1.5 million m3). In 2017, fostered by rising prices, non-Canadian imports reached almost 2.4 million m3. The largest source of non-Canadian lumber imports into the U.S. is Europe. However, while imports from Europe soared in 2017 versus 2016 — reaching over 1.3 million m3 (from 550,000 m3 in 2016) — this was still a long way off the peak of 4.5 million m3 in 2005. In terms of dominance, Germany is the largest supplier (636,000 m3 in 2017), followed by Sweden (377,000 m3), Romania (95,000 m3), Austria (74,000 m3) and the Czech Republic (45,000 m3). Remarkably, during the first two months of 2018, European imports grew by 125%. The largest non-Canadian/non-European exporting countries to the U.S. in 2017 were Brazil (373,000 m3), Chile (333,000 m3) and New Zealand (228,000 m3), followed by China (37,000 m3). Now, they really don't make them like this anymore.